This article submitted by Erin Aagesen on 7/26/00. Country music fans gathered in Regal over the weekend for the 11th annual Cornstalk music festival. Around 7,000 people gathered on Friday to watch performances by KeyStone, Ricochet, Brad Paisley, Chely Wright, and BlackHawk. This number doubled last year's Friday showing. 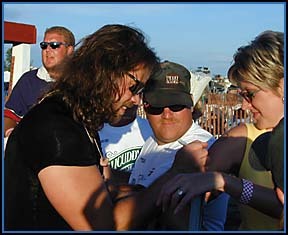 Joe Caverlee, the fiddler for Yankee Grey, signs an autograph on the arm of a fan Saturday at Cornstalk. Eight thousand people attended Saturday's show, which included Brad Paisley, Collin Raye, Lee Ann Womack (at left) , and Chase Roberts. This number was up slightly from last year. "It went wonderfully," said Jerry Vlaminck, owner of the County Line Bar, which organized the event. "It was a real nice atmosphere." According to Vlaminck, the most popular act was Collin Raye. The crowd showed their appreciation of him with a five-minute standing ovation. Local artists displayed their talent throughout the two-day festival as well. Among these were: Mississippi Drifters, Diamond Back, Dixie North, Led Stetson, Doolin Dalton, and Naked Cowboys. Bob Brauchlar provided a fireworks show on Saturday evening. Many concert-goers camped out on the festival grounds. This was the first year that all 678 sites were filled. "I'd like to give a special thank-you to our volunteers," said Vlaminck. "People from out of town complimented the friendliness of the people around here."